After taking some time off early in the summer, I usually go back go to my classroom for a couple of days in mid-summer to begin to get ready for the upcoming school year. This summer, that entails finishing some painting in my classroom. During the summer of 2016, the school district that oversees my independent charter school did a compliance sweep of the entire campus. According to the district, all classroom walls MUST be bare within 24″ of the ceiling. In years past, my classroom walls were covered with posters, going all the way to the ceiling. This was due in part to my dislike of bare walls in a classroom, and my dislike of the “institutional white” paint prevalent in so many schools, including my own. Admittedly, the look that I had cultivated was a bit cluttered, but, at least, it was dense in an informational sense. But, because my classroom was out of compliance, I had to make some changes. First of all, I stripped off all of the posters in my room at the end of the summer in 2016. This not only meant removing posters from all of the walls, but also from cupboards that were covered by rather cheap looking, old, white, foam board. Second, with help from my school’s generous Booster Club, I commissioned a local artist, who had done other projects around campus, to design and paint a new look for my classroom. We decided to completely paint over the “institutional white” with a dark purple to mimic the night sky. Texture would be added with airbrushed stars. The artist also began work on two major themed murals in the room. The first is a not to scale model of the Solar System along one wall, beginning with a highly detailed painting of the Sun in the back corner of the room. The planets were subsequently painted to scale in size in relation to the Sun, but not to scale in distance. Each planet includes some basic information such as mass, orbital period, and so on. The artist will finish this portion of the classroom with a description of how far from my room each planet would have to be in relation to the size of the painting of the Sun. Below this mural, I decided to place the posters that I had originally taken off the walls, but I mounted the posters onto new foam board for portability. I have more posters than I have room for below the mural, even after culling the posters down from my original amount; so, I will rotate these posters throughout the year as units and themes change in my curricula. The second major mural is a timeline of the Universe from the moment of the Big Bang to the present day. Right now, this mural consists of four major components with, at least, two more components to be done. That should be finished, according to the artist, by the time that school starts in a few weeks. Lastly, a couple of individual paintings on the dark purple background near the front of the room will be done to complete the new look. As for my cupboards that I’ve previously mentioned, during the school year last year I had those re-covered with brand new, clean white boards. Subsequently, I re-postered those cupboards with a much cleaner look. I’m very happy with the results. Although I’m not much of an artist, I can, at least, put base coats on bare walls, and I did some of that this summer to complete the painting over of the “institutional white.” Once again, I’m very happy with the results, and I expect the artist’s remaining mural work to be done soon. The view from the front corner. Looking towards the front of the room. The Big Bang. More detail will be added. The large scale structure of the Universe. …to the Solar System and the present day. The Great American Solar Eclipse of Monday, August 21, 2017 is now 29 days away. The eclipse is total, and the path of totality sweeps across the entire country from Oregon to South Carolina. If you’ve not seen a total solar eclipse, and you’re considering getting into the path of totality, do so. I cannot stress enough how incredible the experience is. A total solar eclipse is, perhaps, the most fantastic sight in nature. I’ve seen two totalities (1979 and 1991), and I’ve literally been waiting for this event for decades. I’m positioning myself near Madras, Oregon, where I will get about 100 seconds of totality. For most of the lower 48 states, the eclipse will be partial, and will still be an enjoyable experience. Some school districts will already be in session on August 21, including my own (yes, I’ll be taking two days off from work). Here are a few tips on how to safely view the eclipse, and to get your students excited about the event. In southern California where my school is located, the moon will cover about 62% of the Sun at maximum eclipse, which occurs at about 10:20 am PDT. The Sun will be too bright to directly look at, even at maximum eclipse, so safety is paramount. First of all, I highly recommend purchasing a pair of so called “eclipse glasses”. Go to My Science Shop (a subsidiary of Astronomy Magazine) to find these excellent wraparound glasses. These wraparound glasses (I’ve bought six pairs for family and friends for our trip to Oregon) safely allow you to look directly at the Sun. They’re $20 apiece, and well worth it (you can also use these glasses to look at the Sun at any time, for that matter). You can also buy a 5-pack of these cheaper versions for $10. I prefer the wraparounds, though, for the extra safety and durability. 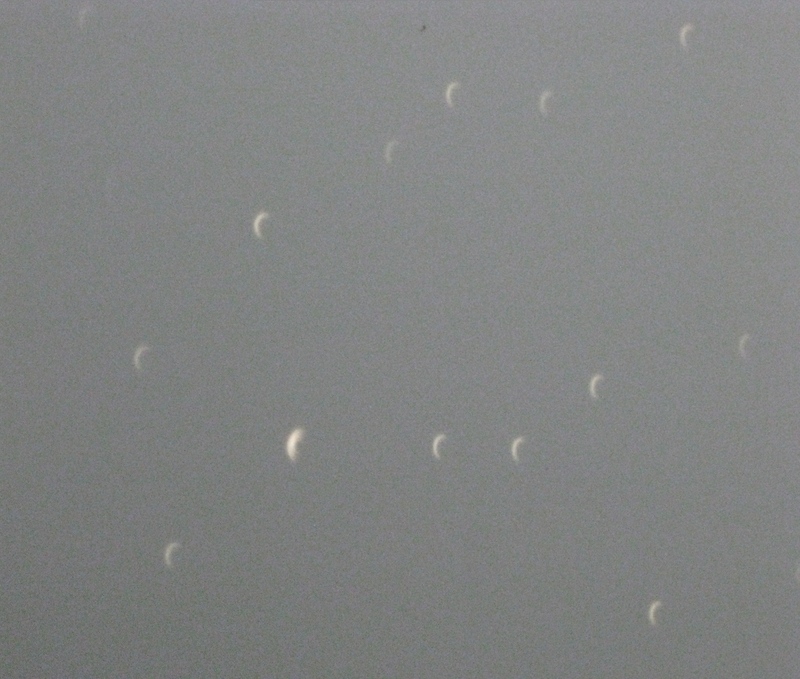 You can also observe the eclipse with some simple pinhole projections. Prepare your students ahead of time. Take some cardboard and punch some holes in it with a hole punch. 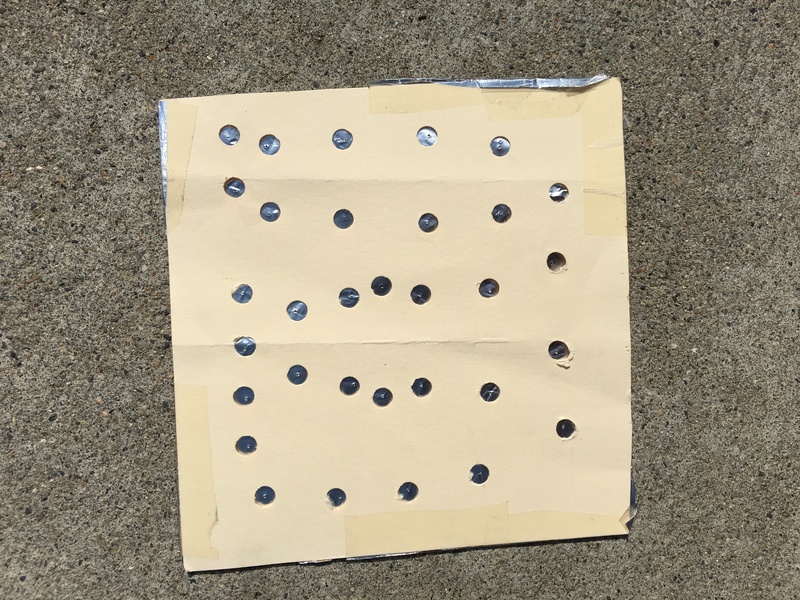 Tape tinfoil over those holes and poke a hole in the tinfoil with a pin. Hold the cardboard perpendicular to the Sun’s direction. Cast the Sun’s image onto a piece of white foam board held behind the cardboard. 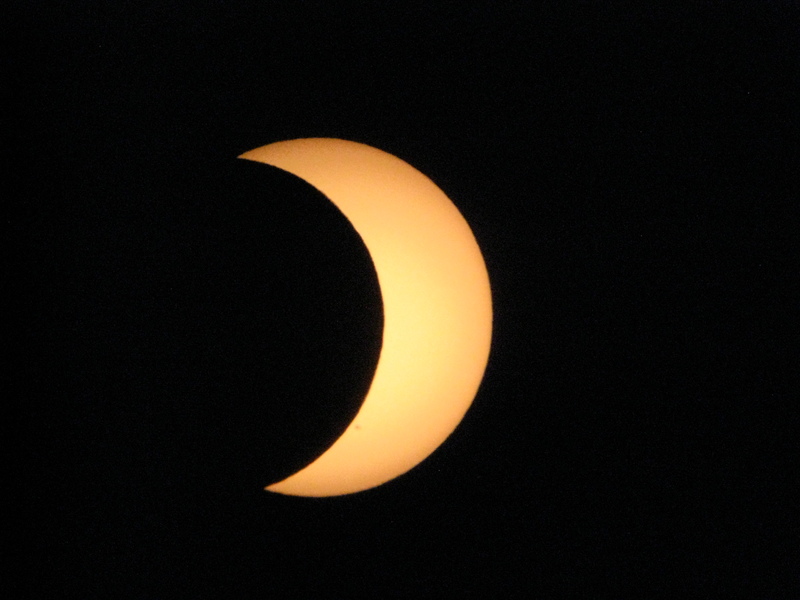 I’ve attached a few photos from the partial eclipse of May 20, 2012, as an example. 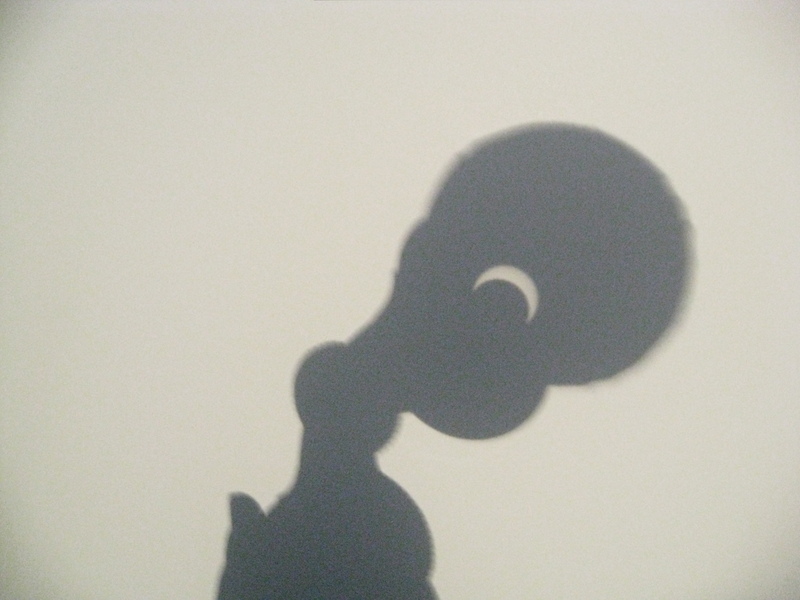 That eclipse, by the way, was an annular eclipse and, from my location, I observed about an 80% partial. Another means of projecting is to tape cardboard (with the tinfoil pinhole) over the objective lens of binoculars, but with a wider pinhole. Cast the magnified image onto foam board. If you have a tripod, mount the binoculars to steady the image. Tree leaves can act as a natural source of pinhole images. 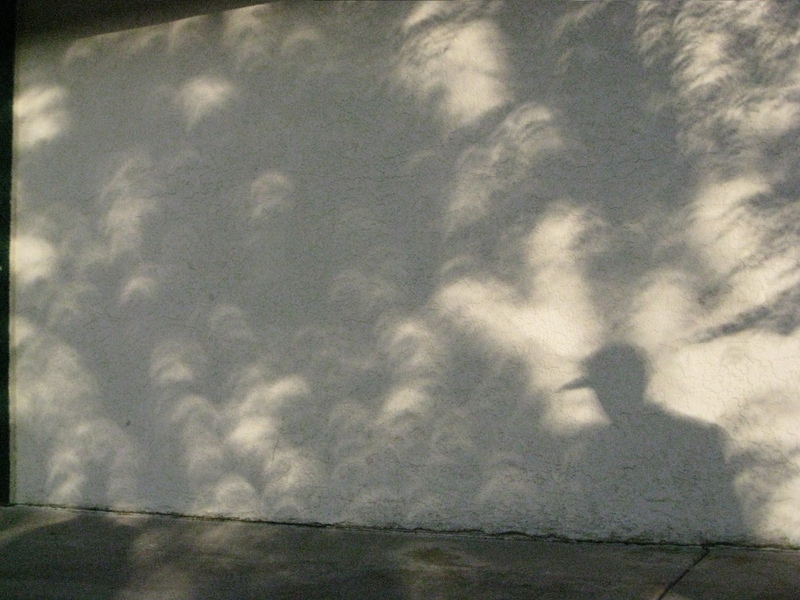 Especially at maximum eclipse, look for pinhole images of the near crescent Sun on the ground from sunlight filtering through the leaves. An example of when I observed such images projected onto a white wall is attached. I’ll prepare my students and my substitute for the event the week prior. 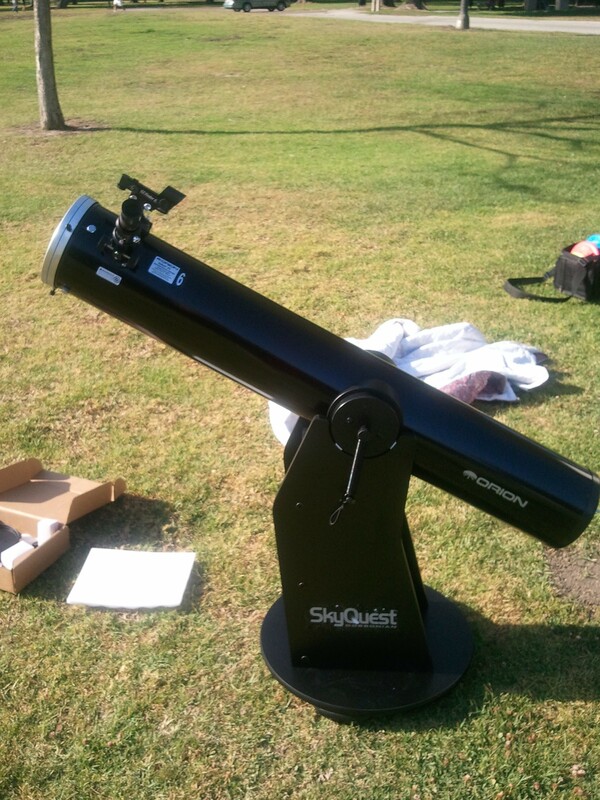 I’ll be doing these simple things in Oregon, as well as observing the eclipse, both partial and total, through a Dobsonian telescope with a solar filter. Lastly, if you’re thinking about getting into the path of totality, take a look at this interactive Google map as an aid. I wish you all the best in your endeavor to observe the eclipse, with or without students! 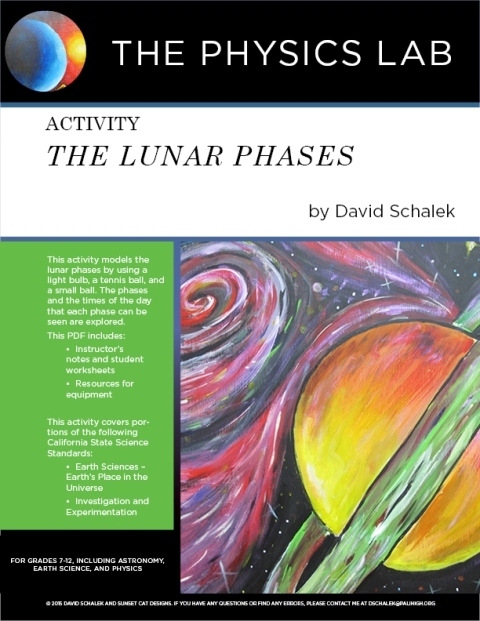 As part of your preparation, a lesson plan and activity about lunar phases is helpful. You can find a version of my own lesson here. Have some idle time over the summer and wish to be productive for the upcoming academic year? 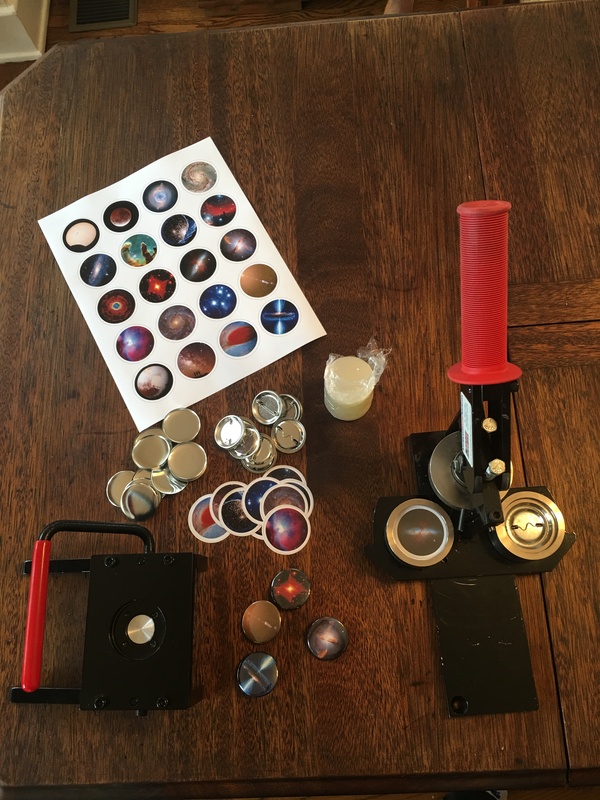 Consider making some buttons! My wife bought a button making machine and all of the necessary accessories a few years ago for her small business, and I’ve co-opted those materials for my own purposes. 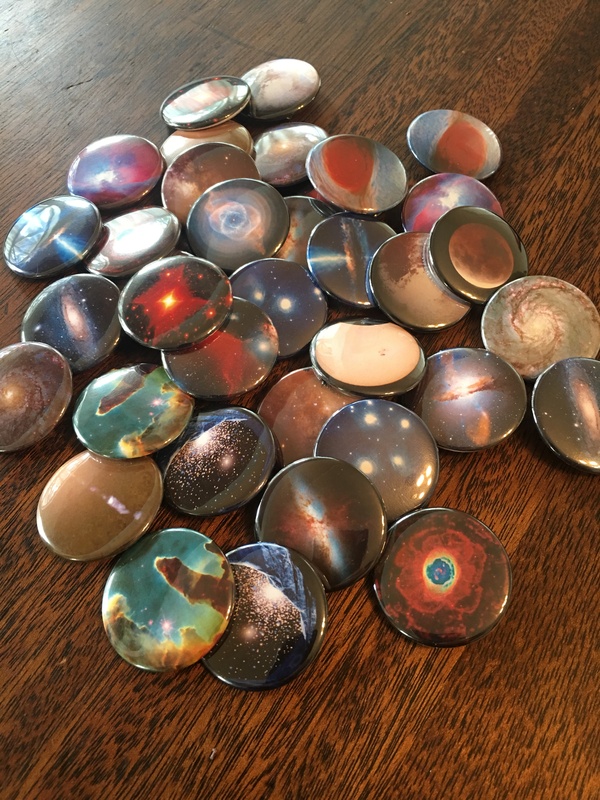 I construct a few hundred 1.5″ buttons each year during the summer, and I hand them out at various times during the school year. For example, early in the year, I hand out buttons to parents on Back To School Night. This especially comes in handy when asking for donations. I also hand them out to well performing students throughout the year as incentive. 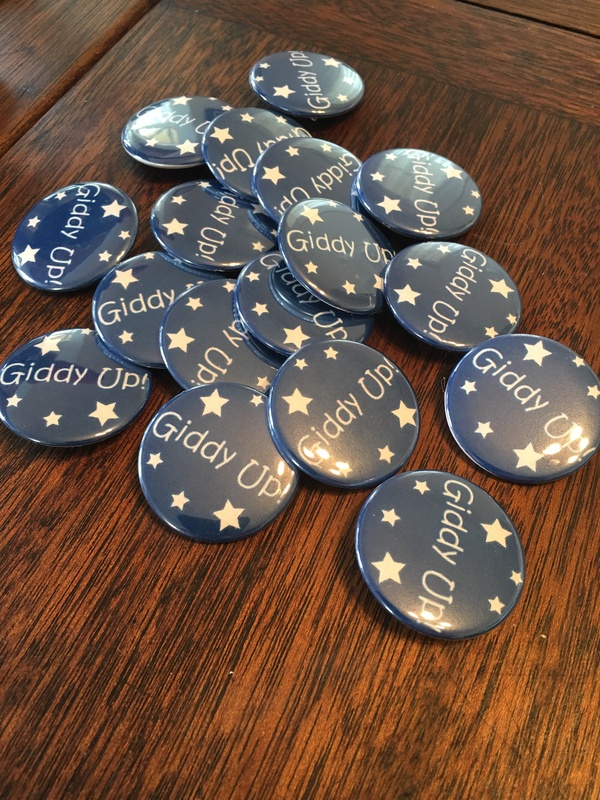 Buttons are also a fun way to help recruit students into your classes, and I do a round of promotion when counselors are programming students for the next academic year. This usually occurs in mid-spring. 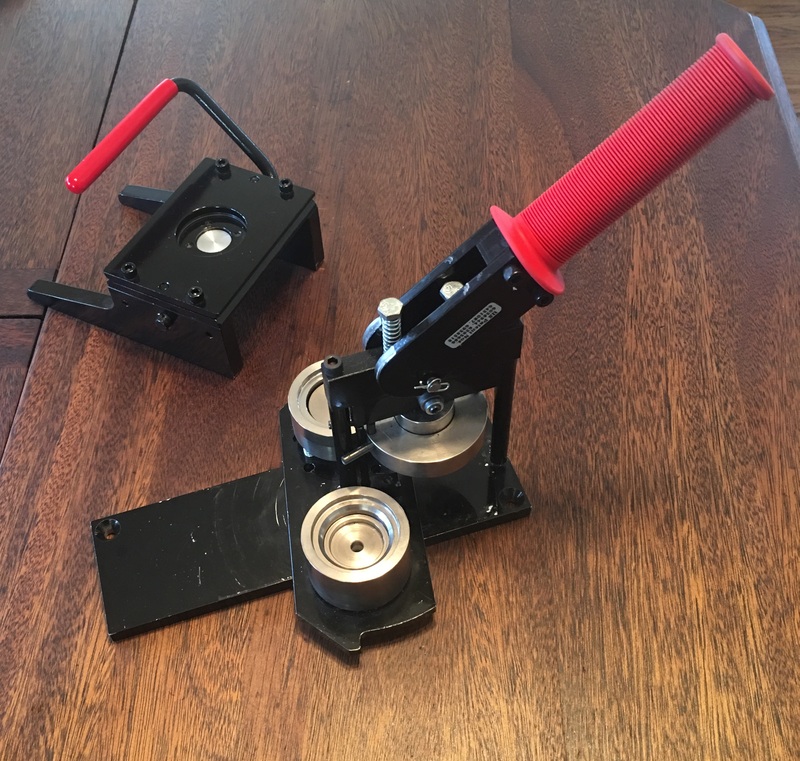 Admittedly, the initial investment of a few hundred dollars for the machine and the paper cutter is daunting, especially in an age of ever tightening budgets. Afterwards, though, if you buy the button materials in bulk, each button costs you about 10 cents to make, plus your time. But, when I see the faces of students, parents, administrators, and the school’s boosters light up at the finished product, I consider the effort to be a worthwhile investment! Dropper Poppers are educational toys sold by Arbor Scientific (and a few other vendors). A few years ago, I had a few dollars left in my annual budget, and I bought a few. 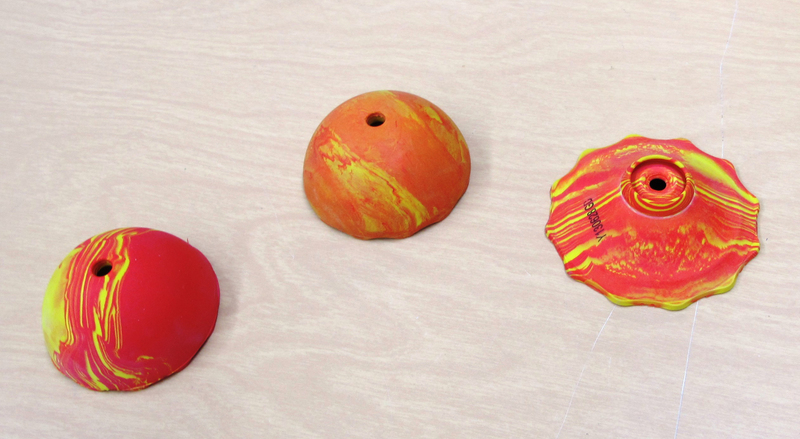 Initially, I used the Dropper Poppers as a means of demonstrating multiple forms of potential energy, but I soon realized the potential for a short and simple laboratory exercise. The result is my free product at Teachers Pay Teachers called Mini Lab: Dropper Poppers. In the exercise, students fold the Dropper Popper, thereby giving it some elastic, or spring, potential energy. The Dropper Popper is held at a height above the floor and dropped, thereby enabling it to “pop” when it hits the floor. Subsequently, the Dropper Popper rises to a greater height. I turned this simple demonstration into a short laboratory exercise that allows students to measure the Dropper Popper’s spring constant. I’ve incorporated this exercise into my algebra based Physics AB curriculum. The exercise fills a space in my Physics AB curriculum while my Calculus based Honors Physics AB classes are exploring the more advanced concept of gravitational potential energy in its Newtonian form. In short, this exercise is an excellent means of differentiating instruction between the two classes. 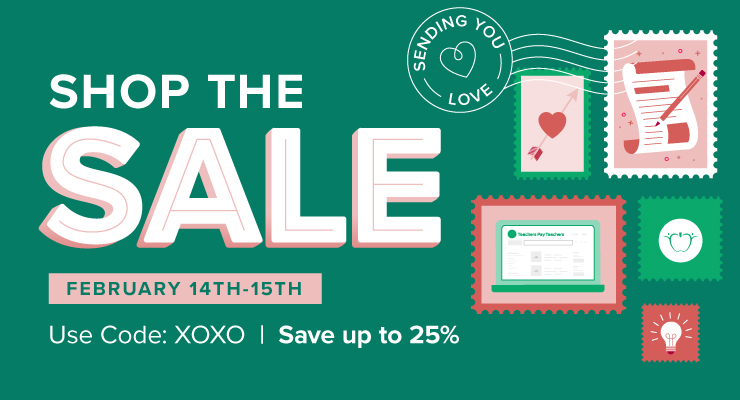 Also, I have a new email newsletter in the works! 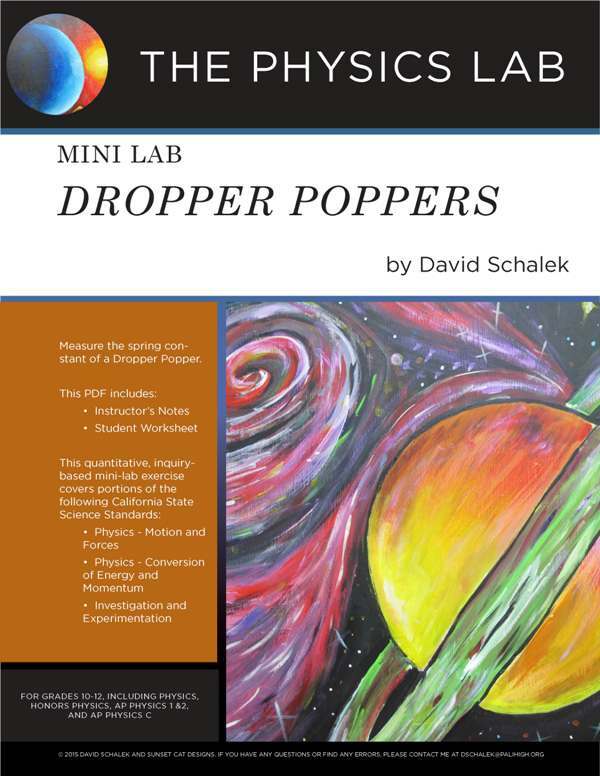 By signing up, you’ll receive a free copy of Mini Lab: Dropper Poppers! I originally started this site about two years ago, but, frankly, never really got off the ground. I found WordPress to be initially cumbersome and very user “unfriendly”, especially after using Blogger for years for an unrelated hobby, rather than as a work-related site, which is my intention here. Regardless, I intend to upgrade the look of this site in the near future, but, at any rate, let me begin anew. I am a high school physics and astronomy teacher in Southern California with over 20 years experience. I hold a Bachelor of Science degree in astronomy and physics from the University of Arizona, and a Master of Arts in Teaching degree in physics from UCLA. I am a National Board Certified Teacher, and have been since 2000, my first year of eligibility. I renewed my certification in 2010, and I will do so again in 2020. In 2008, I was the recipient of the Petrick Award, which is awarded to outstanding teachers in my school district. Currently, I teach AP Physics C, Honors Physics AB, and Physics AB. I also administer Astronomy AB, which is an independent study course, and, in the past, I have taught Integrated Coordinated Science AB and an Earth science class called Physical Geology AB. 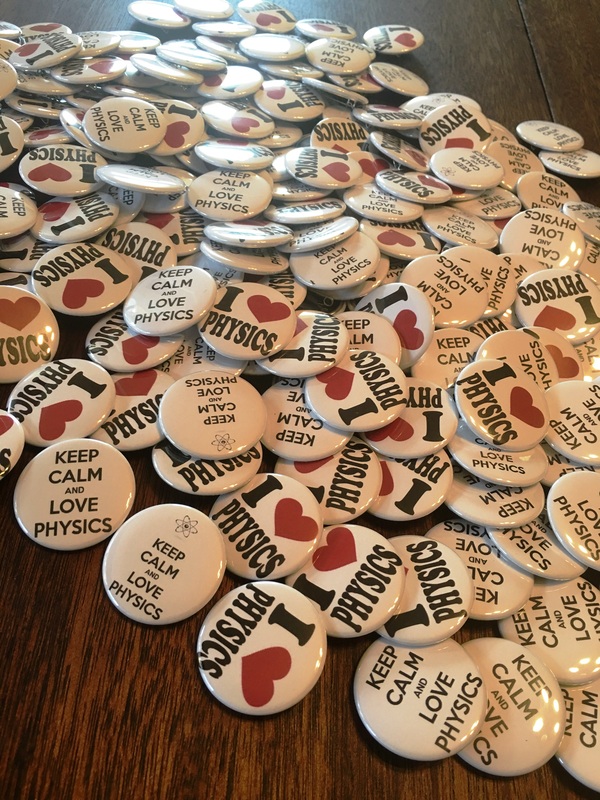 AP Physics C covers classical mechanics and electromagnetism and is a rigorous, quantitative , Calculus-based introduction to physics. Honors Physics AB is a less strenuous, though still rigorous, Calculus-based introduction to quantitative physics, as well, but has a different curriculum than AP Physics C. Physics AB is similar to Honors Physics AB, but is algebra-based and the rigor is toned down. Regardless, the focus of all of my courses is the development of critical thinking skills through problem solving, and to introduce the student to the scientific method through numerous laboratory experiments. I’ve spent a great deal of effort developing rigorous curricula for all of my courses. 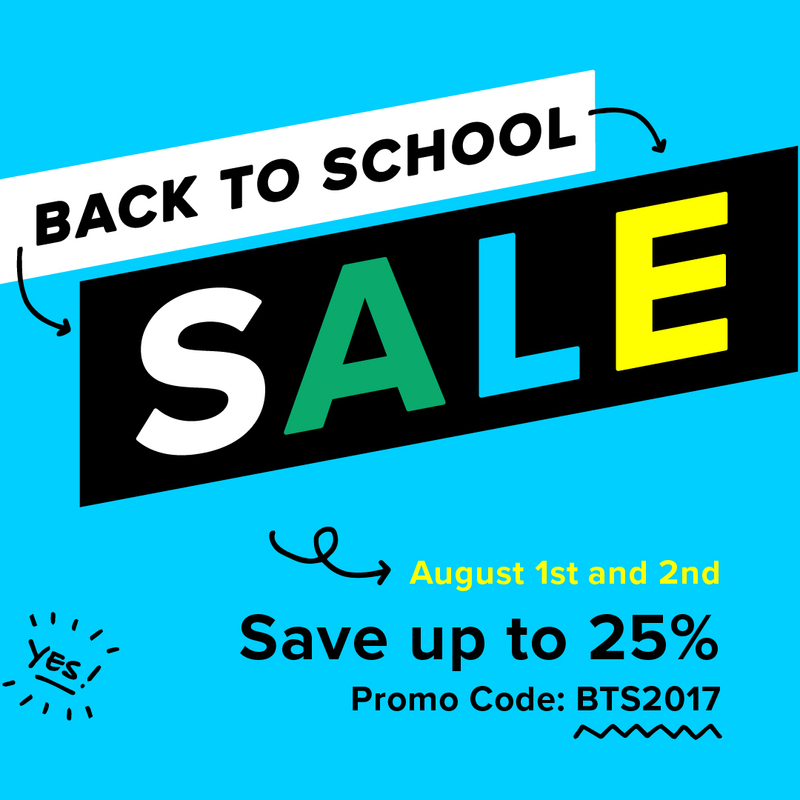 With that in mind, I am offering my expertise to the physical science education community through my small, web-based store at Teachers Pay Teachers. Currently, I have over thirty products for sale for a small fee, and I’ve many more in development. Please fee free to browse my current line of products. Thank you.